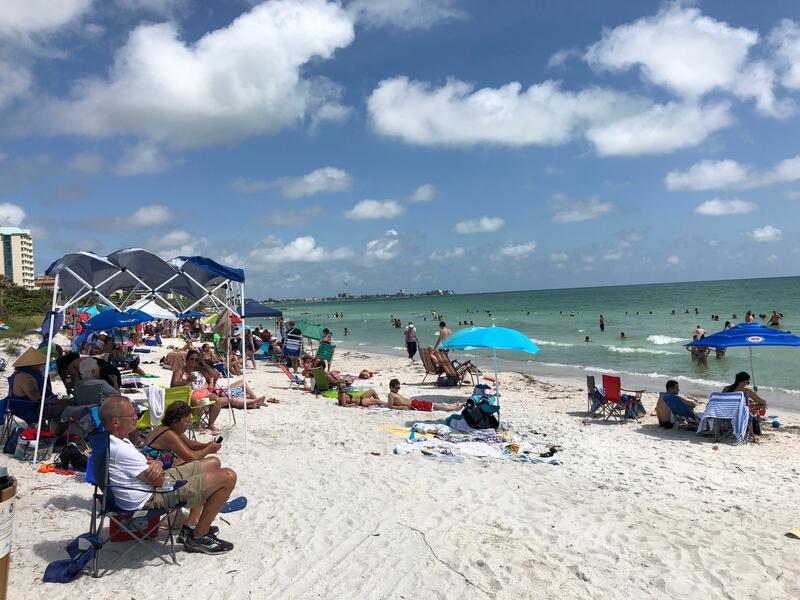 SARASOTA — An emergency project to replenish the rapidly diminishing shoreline at Lido Beach with more sand is complete. The city last week wrapped up an emergency renourishment project which started last November and added an average of 40 to 80 feet of shoreline to parts of critically eroded Lido Beach. The project, which finished on April 4, used approximately 205,000 cubic yards of sand from New Pass to protect structures, including the Lido Beach Pool and Pavilion from the Gulf of Mexico, which posed a serious threat to the popular tourist destination. The project cost of $3.9 million was shared by the city, Sarasota County, the state and the Federal Emergency Management Agency. The city’s funding portion was approximately $600,000. “It’s a relief knowing we will go into hurricane season with an added layer of protection from the pounding surf,” City Manager Tom Barwin said in his weekly newsletter on Friday. City officials in the past estimated Lido Beach lost an estimated 15 feet in the aftermath of Hurricane Irma in 2017 and Subtropical Storm Alberto last May, prompting Barwin to declare a state of emergency. The erosion on Lido Beach had also started to take a financial toll, impacting businesses and causing property damage along the barrier island. Private properties sustained some damage from Alberto and the concession stand at the pavilion suffered economic losses, Barwin has said. City workers last August installed a series of jumbo bags filled with 500 tons of sand around the city-owned pavilion after city officials noticed nearby dunes, which serve as a natural barrier from the ocean, began to disappear from erosion. The bags will remain in place until a planned long-term renourishment project is slated to start later this year, city officials said. Prior to the emergency project, the beach conditions were the worst City Engineer Alex Davis Shaw had seen in 30 years, she said. “The project has added a critical buffer to protect wildlife habitat and public infrastructure. We’re now looking forward to the larger project, which will reduce the rate of erosion on Lido and make future renourishments less frequent,” Davis Shaw, who oversaw the project, told the Herald-Tribune in an email. The larger, long-term beach renourishment project is expected to begin this fall. The initial renourishment would take 950,000 cubic yards of sand from Big Pass, and subsequent restoration projects would occur every five years, dredging about 500,000 cubic yards each time. The projected cost is $20 million to $22 million and will be covered by a mix of local, state and federal funds.